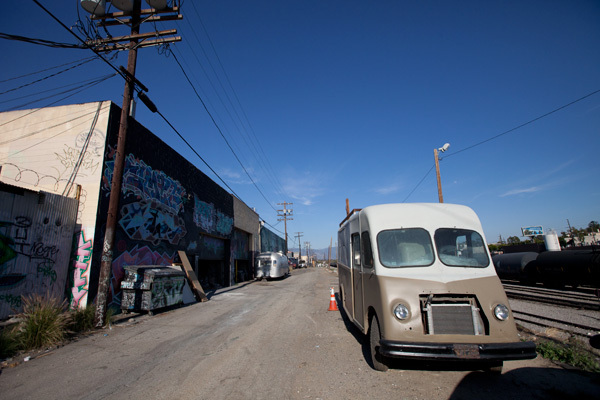 The latest from our NOTlabs head maker/fabricator/hacker, Shawn Sims, as he adventures through LA visiting some amazing fabrication shops/people! 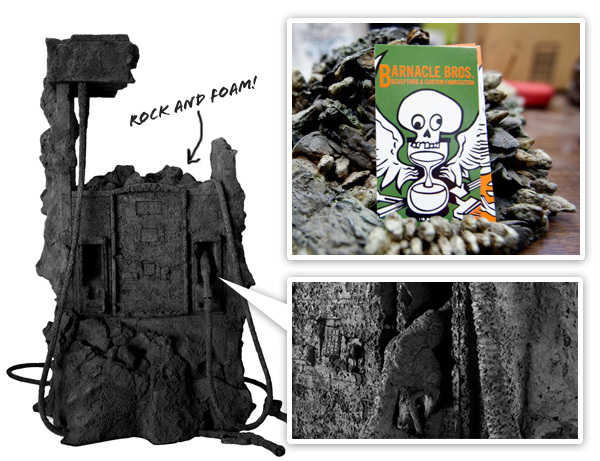 Barnacle Bros. is an East LA sculpture and custom fabrication shop that has been serving the arts and entertainment industries since 1997. 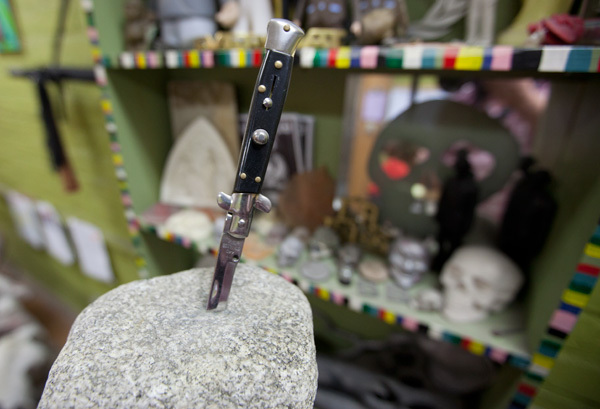 “Barnacle Bros is an artist studio founded in 1997 by a friendly group of artists, craftspeople, performers, and local personalities. 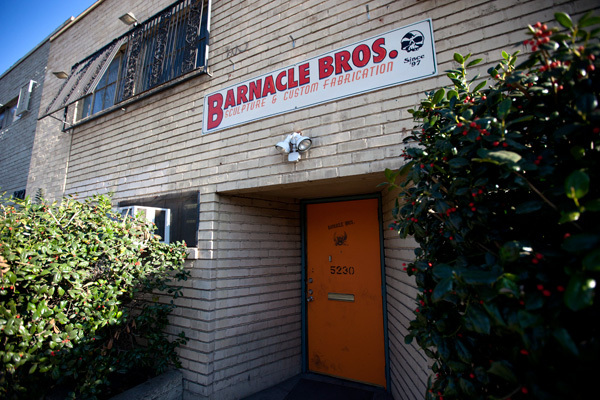 The folks at Barnacle Bros. are well versed in all media and processes. We specialize in wood, metal, fiberglass, composites, foam, resin, bronze, aluminum, stainless steel, stone, sculpting, casting, mold-making, models, miniatures, furniture, architectural elements, prototypes, and, of course, puppets.” Smilee and Karl specialize in the crazy, weird, and hard to build, and gave me a wondrous tour through their shop. 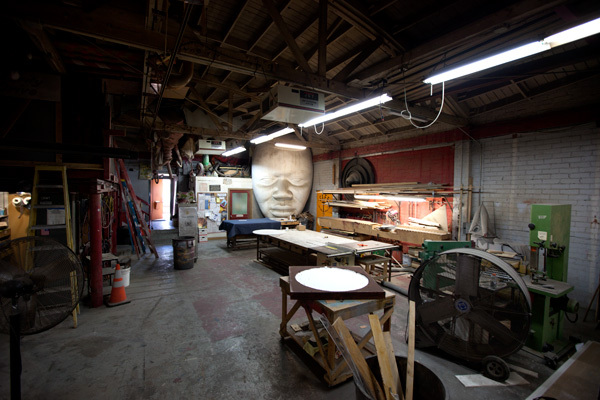 Stepping into their space you will find yourself surrounded by remnants of Hollywood sets, clowns, knives in rocks, and 20 foot tall faces. 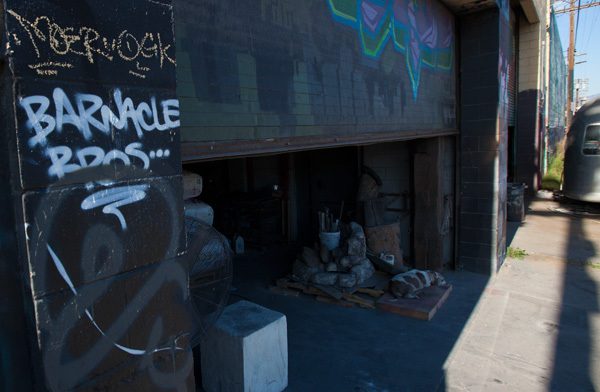 It’s nothing short of awesome to wander through this workshop and get to see how it’s all made. 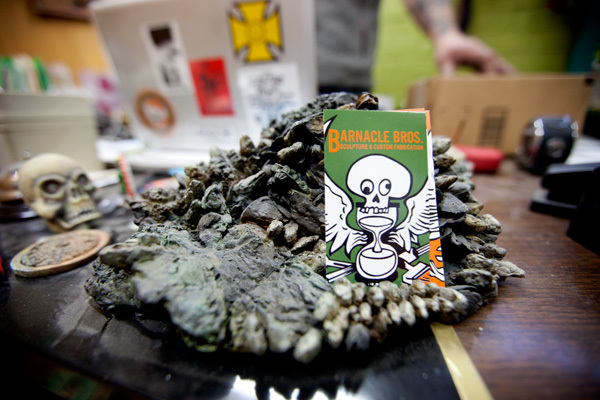 The company gets its name from one of it’s first jobs where they molded and casted bronze barnacles form a pier on Venice Beach, and has since pulled off many more crazy projects for artists and festivals all over the world. Take a peek at more pics on the next page! 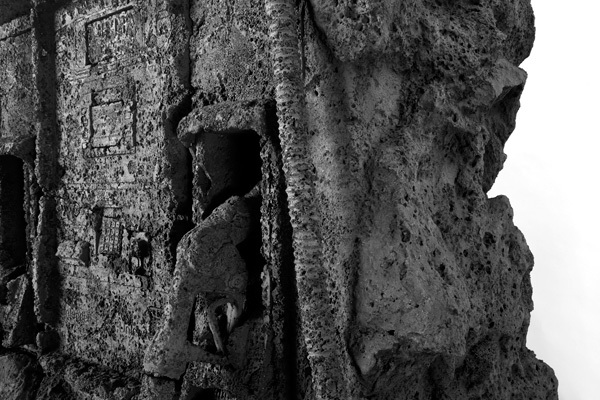 It’s fitting to see the bronze barnacles welcoming you into their office. These antler coat hangers are actually made from a mold of a real one. There are even brass knuckles spelling what + ever. Sticking a knife through a rock is not easy. The fit is so precise that you can not see where the slit was that the knife fit into. 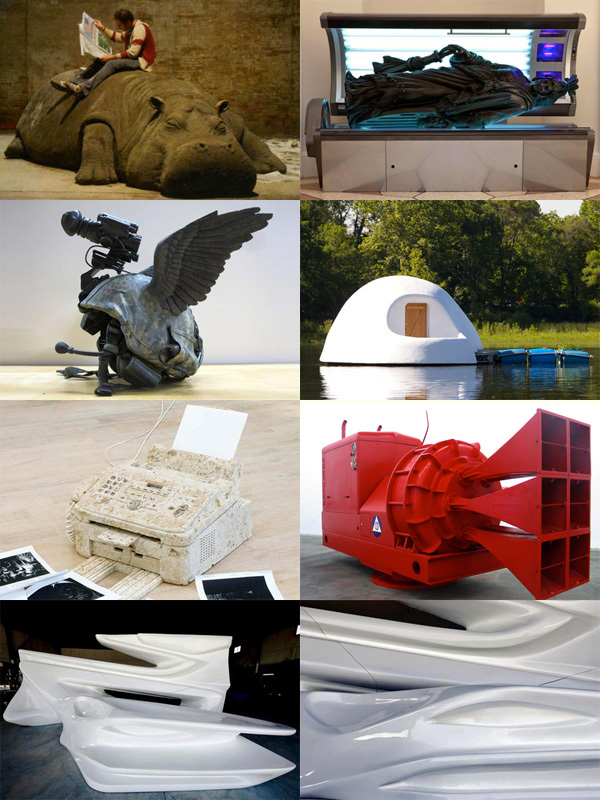 Massive hippos, working stone fax machines, giant fog horns, floating houses, and a sculpture for Zaha Hadid are among other jobs taken on by Barnacle Bros. 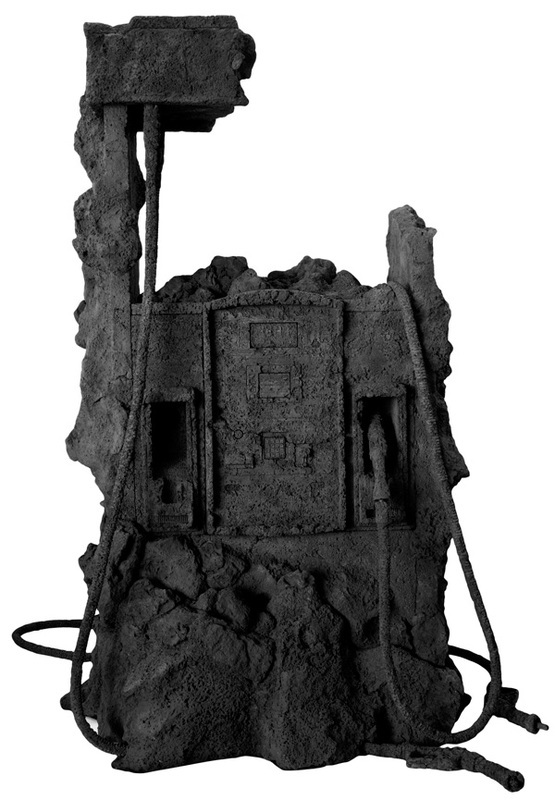 These gas pumps are made from part real stone, part foam, and provide a pretty amazing effect of a fossilized pump. 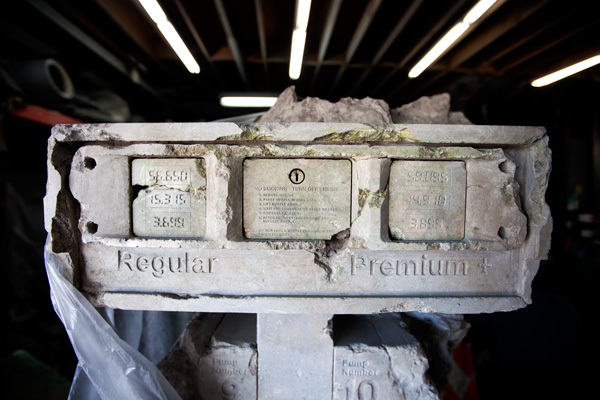 The real stone is attached to the frame and then foam is applied to fill in gaps. Once the foam hardens they chip away at it with a pneumatic brush chisel. 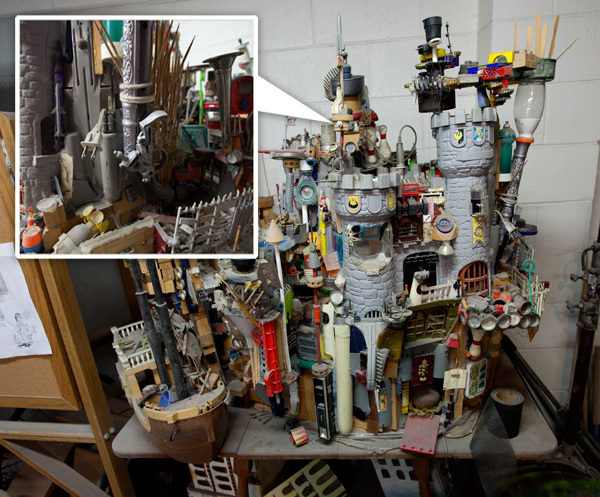 The Trash Castle caught my eye as I wondered through a 2nd floor room. The detail is amazing and some interesting uses of materials. Out back is an old-school truck that will be converted to a mobile puppet theater as well as an Airstream that is one big kitchen. Im trill by the work you guys do,, DAnielle the Painter,, she has only good things to say about you guuys,,, you guys ROCk..
Crazy objects, nice pictures, I’m not sure I could display all of them in my living (or garden ???) but thanks for this cool blog ! keep’on.